#13 Terriers’ post-season run came to an end in Worcester as #10 Michigan broke a 3-3 tie in the third period and went on to a 6-3 win to claim the NCAA Northeast Regional title. BU had rallied from a 3-1 deficit to knot the score on goals by Patrick Curry and Drew Melanson, before Jake Slaker capitalized on a turnover with his shot deflecting off Cam Crotty and past Jake Oettinger for the eventual game-winner. Jordan Greenway had scored for BU in the first period. ►Today, Greenway signed a three-year entry level contract with the Minnesota Wild. BU finished its season with a 22-14-4 record, its first Hockey East Championship since 2015 and its ninth conference title overall. Michigan moves on to the Frozen Four and could meet its arch-rival, Ohio State, in the final. “The bottom line is that you have to win a hockey game, you have to overcome that stuff, and if we had played better early on, we wouldn’t have been in that position, so it would be nice to get those bounces,” Boston University coach David Quinn said. “But if I’m focusing on the fact that we were nervous early and we didn’t play well, that’s why we lost the game." The Wolverines took the lead five minutes into the game on their first shot, a blueline blast by Quinn Hughes that beat Oettinger five-hole. Seven minutes later, after Brady Tkachuk separated Hughes from the puck in the neutral zone, Greenway skated down the left side and rifled a shot past Hayden Lavigne’s left shoulder for a 1-1 tie. Michigan regained the lead at 15:21 on a power play as an unmarked Tony Calderone beat Oettinger from the high slot. Later in the period a head-scratcher penalty call on Logan Cockerill—when it was clearly the Michigan skater who was guilty—put the Wolverines back on the man-advantage. BU effectively killed the penalty and Greenway nearly scored on a breakaway. Just two minutes into the middle period, a potentially crushing fluke goal extended the Michigan lead. A hard dump-in by Josh Norris came off the end boards, caught Oettinger’s pads and skittered to his right for an easy tap-in for Brendan Warren. Deflated at first, the Terriers began to go back on the attack. At 11:08, Curry picked up a rebound of Crotty’s shot, circled the net and stuffed the puck home before Lavigne could cover the post. Chad Krys also assisted. BU pressed the attack, but the period ended with Michigan on top, 3-2. Early in the third period, BU’s forecheck paid off. Greenway deflected Joe Cecconi’s attempted pass to Melanson who quickly deked and slid the puck past Lavigne’s glove. BU continued to press Michigan with Ty Amonte having a good scoring opportunity, but the momentum disappeared in an instant when Hickey whiffed on a pass just inside the BU blueline. Slaker picked up the puck, skated to the left circle and fired a shot that went off Crotty’s shin pad and into the net for a 4-3 lead with 13:33 left. 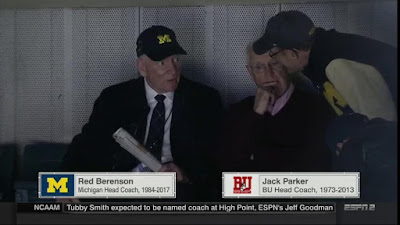 For the next 10 minutes BU tried to generate an equalizer but to Michigan’s credit, they kept the Terriers from sustaining an offensive zone attack. 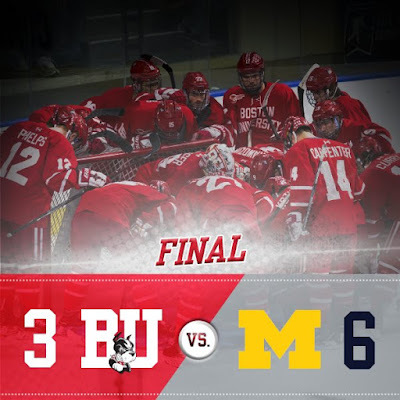 A two-on-one Wolverine break resulted in Nick Boka beating Oettinger for the crusher and an empty-netter closed out the scoring. 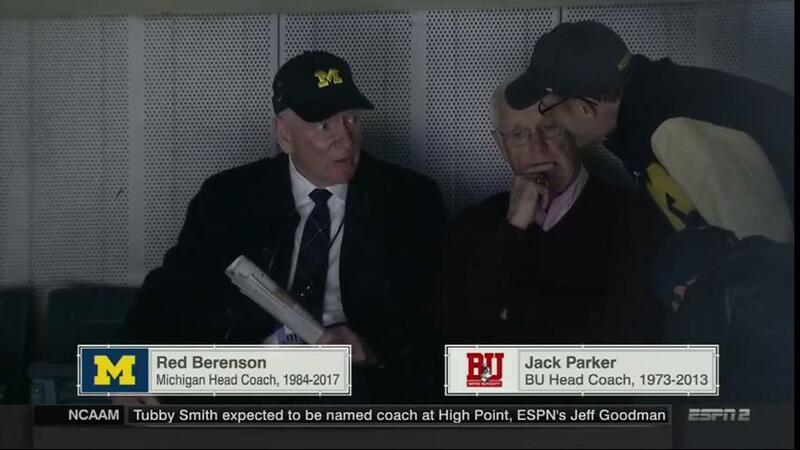 A pair of college hockey coaching legends took in the action at the DCU Center.